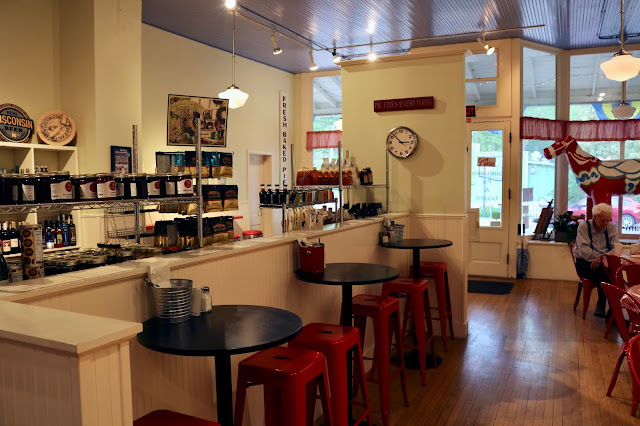 Amy's Creative Pursuits: Time For Some Pie At Stockholm Pie! In last week's travel post I wrapped up our spring vacation to Savannah and mentioned I would be doing a few "Staycation" posts before I have a new travel series to share. In May, we planned to vacation with the kids to see the Columbus Zoo, the Creation Museum, and the Ark Encounter. BUT, as usual, we ended up having to cancel that vacation because my husband had to fix the roof on our house. Grrrr. So we stayed home but tried to make the make the best of it by having some fun days locally. One of these fun days we went to Stockholm, Wisconsin. It is so tiny if you blink while driving through it, you will miss it. But if you're ever in the area you must stop and visit because it is adorable! The main reason we went to Stockholm was to eat lunch at the Stockholm Pie and General Store. One of my dear friends told me about this place, and I've been wanting to get there ever since...now I finally had my chance! The building has a cute vintage charm inside and out. The inside is decorated SO CUTE!!!! The colors were blue, red, black and a creamy white. 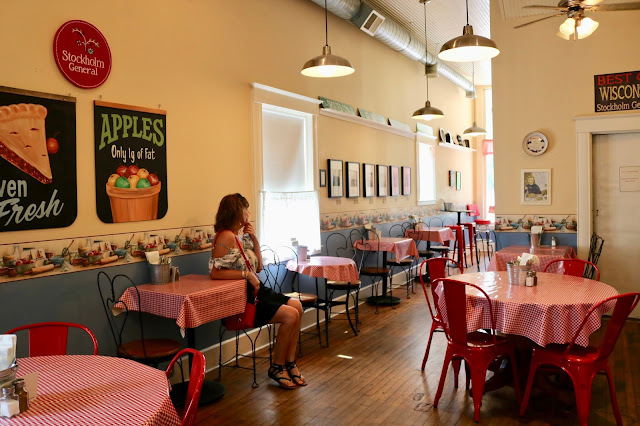 All the tables had that vintage ice cream parlor feel and were covered in red gingham table cloths. 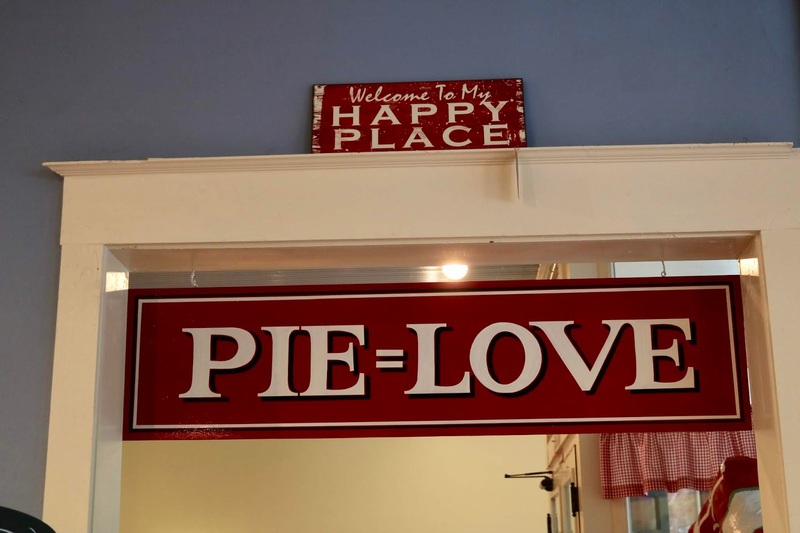 The restaurant was filled with cute pie sign decor. Stockholm Pie is more than just a restaurant, you can also buy food items like pure maple syrup, jams, jellies, coffee grounds, wines, chocolates and other sweets, to name just a few. 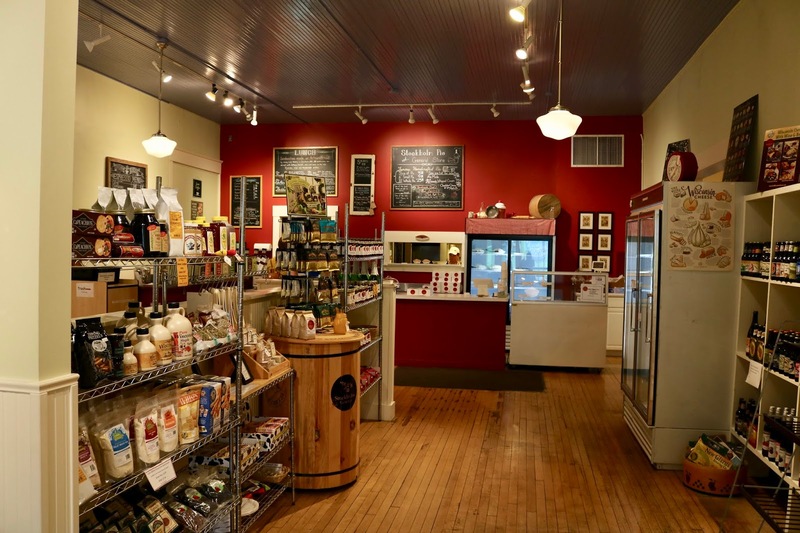 In their General Store are fun gifts like T-shirts, aprons, cards, home decor, and so much more! 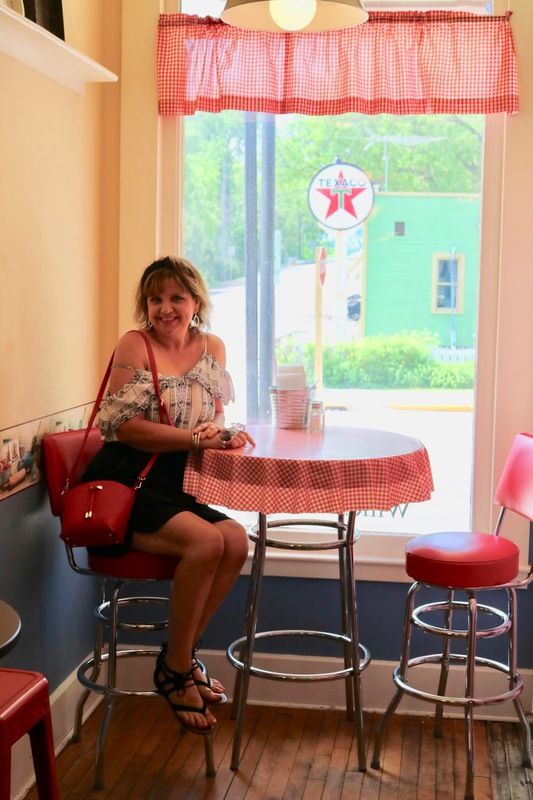 We placed our order at the counter and then chose this cute little window seat overlooking an old Texaco station (now converted into a restaurant) to wait for our meal. I ordered the "Capri" sandwich and my husband ordered the Chicken Pot Pie. I absolutely LOVED my sandwich; so much so, I might have to try making one myself at home! The ingredients were fresh mozzarella, basil pesto, tomato, balsamic vinaigrette, and "Joe's special 4 cheese garlic sauce on spinach mozzarella bread". I won't be able to mimic the sauce or the bread, but I'm sure I can find a suitable alternative. My husband liked his pie, but wasn't thrilled with it. He felt the ration of peas in comparison with the other vegetables was too much: and he does not like peas! haha! For pies, we both chose a cream pie and neither one of us thought we made the right decision. I chose this chocolate cream pie which looks delicious (and why I chose it), but it was so rich one or two bites, and I was done! Plus it was very dense, like hard to put my fork through dense. I would have preferred something more fluffy for the filling. Hubby chose Coconut Cream Pie and thought it was o.k. but wasn't quite in love with the taste. Next time we go back, we will skip the creamed pies and try a fruit pie. I have the feeling we will be happier with those! After we were done eating, we walked about town and visited some of the gift shops. Here is a better look at the Texaco Filling Station converted into a restaurant. This is a view of one of the side streets in Stockholm. I told you it was small...blink and you miss it. This is the Historic Stockholm Hotel...still open for business! 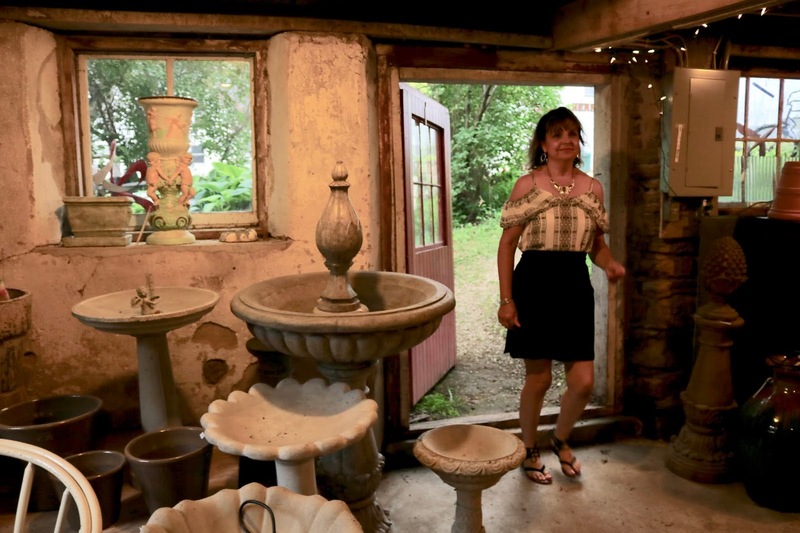 A house turned into a fun business. This is the main street in Stockholm where the majority of businesses are located. I found a great pair of flip flops ( shoes previously shown here) and some jewelry at one of the stores here. My husband had me put one of the necklaces I bought at the gift shop in Stockholm on right away, so you can see one of the them in the pictures below. The other one I wore in my Stitch Fix Jumpsuit post. I LOVE looking in gift shops for unique fashion accessories. The last thing we did before leaving town was check out Stockholm Gardens. They sell annuals, perennials, garden furniture, garden accessories, etc. But they also have beautiful display gardens which I always love to stroll through. 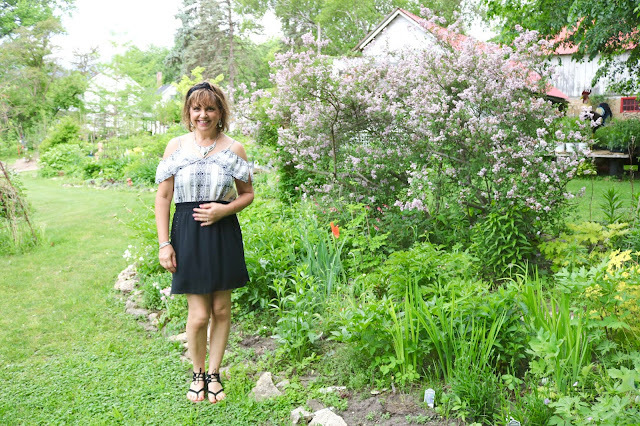 It was late May, so there was not much in bloom but lilacs and iris, but it was still lovely. I absolutely loved this historic building filled with fun garden accessories. It started to rain, so our day ended more quickly than planned. I didn't get to visit all the shops I wanted nor take a walk along the great Mississippi River, but it was still such a fun date and I look forward to going back in the fall. Thanks for dropping by Candi! Looks like a cute little town, the restaurant looks like a place I'd love to visit too with all the cute decor! Wish there were more like it around! I bet all the surrounding forests/hills will look gorgeous in the fall! Oh, I know, it's hard to find such cute places. We were in the area last fall, when we went to Maiden Rock. I remember driving down that side road, but we didn't have time to stop. Hopefully this fall we'll make it back! Sounds and looks like a perfect place for me! It sure is! It's the perfect place for most people! You guys seriously have the best fun!! I'm sure we would have ordered and eaten the pie first---life is short you know? The coconut cream pie looked amazing, although I don't think there is a pie that Rob doesn't like!! Oh, we try! Even when life gives us lemons, we try to make the best of it. I wish I lived closer - this would make a great Artist Date destination! That's funny you should mention that as it is a very artistic community and they even do an annual art show there; it's very popular. What an adorable little town and restaurant. That pie looks delicious (bummer it didn't live up to its appearance). The sandwich also sounds wonderful. Thanks Kristin...oh, it was probably just us. I'm sure other people probably would have loved the pie. I think were more fruit pie people. Cute outfit and hair, Amy! An interesting place to visit. I see they have the Swedish colours hanging outside for authenticity, and the most gigantic Dala horse I ever did see! Thank you! And thanks for mentioning the Swedish Colours and Dala Horse...I really didn't notice and had no idea what the large horse in the window meant. Amy, thanks for the cute glimpse of Americana. That pie shop is adorable. And so are you! What a nice little spot - and you're much more adventurous in your clothing choices than I am - mind you it's the middle of Winter here and I'm wearing three layers! Leanne, this top was my husbands favorite choice from Stitch Fix that's why I kept it. I think he is the adventurous one, haha! I would have sent it back, but he encouraged me to keep it. So I wear it on date nights with him. You visit the cutest places!! I love this and could go for a slice of pie right about now! Oh, we try and find these cute places. 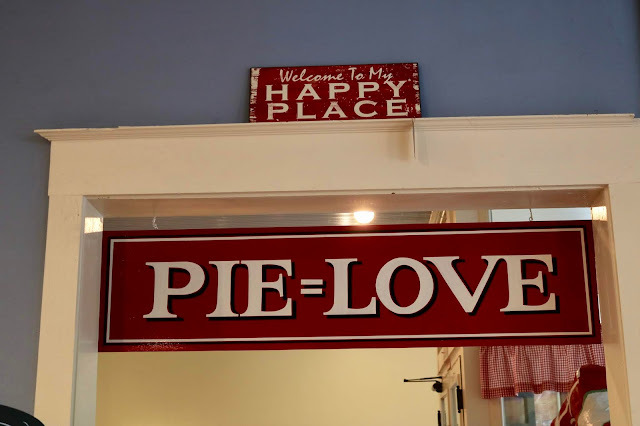 I hope you can find a cute pie place where you live. What a wonderful shop! I would love to visit! Nice photos. Thanks so much for sharing at Thursday Favorite Things! What a cute place to visit. I think they always over do the peas in chicken pot pie. lol And I love peas. Not a fan of chocolate pie but that coconut cream looked very good. That is so interesting. I think this is the first time we've ever ordered a chicken pot pie in a restaurant. I usually just make it at home. I'll tell my hubby that. I'm surprised to hear that. I only see the Walmarts and super grocery stores in mid-size to large cities; not in the tiny towns in Wisconsin. Glad to see you stop by Brenda!